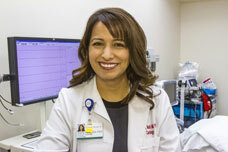 Dr. Shaista Malik, Director of UC Irvine's Preventive Cardiology Program, recommends annual testing for cholesterol, blood pressure and blood sugar as a way of keeping track of heart disease risk factors. There are many things women and men can do to prevent a heart attack, says UC Irvine's Dr. Shaista Malik, a cardiologist specializing in cardiovascular imaging and public health. The most important step is to identify your own risk factors. "Start by knowing your numbers for blood pressure, cholesterol and blood sugar," says Malik, medical director of UC Irvine’s Preventive Cardiology Program. "Almost 50 percent of people who die suddenly from a heart attack have no prior symptoms. Keeping tabs on these numbers gives you a good idea of your heart health." What are some other important ways we can reduce our risk? The American Heart Association (AHA) recommends lifestyle changes as simple as ABC. Avoid tobacco. Become more active. Choose good nutrition. Both men and women can lead healthier lives by eating right, making daily physical activity a priority and reducing chronic stress. If you smoke, stop. All these steps reduce the modifiable risk factors for heart disease, heart attack and stroke. Are there different prevention approaches for men and women? When it comes to the risk factors that you can influence—high blood pressure, high cholesterol, diabetes, smoking, controlling weight, being physically active—the advice is the same. The difference is that women are not as aware of the dangers, signs and symptoms of heart disease as men are. Women also have more risk factors than men. Last year, the AHA released new guidelines on heart disease prevention for women, and it recognized new risk factors in women: a history of preeclampsia and gestational diabetes during pregnancy as well as autoimmune diseases such as lupus and rheumatoid arthritis. What tests assess heart health and how often should they be conducted? Blood tests that check cholesterol levels (both the bad LDL cholesterol and the good HDL cholesterol) and blood sugar should be conducted at least once a year, along with measurement of blood pressure. The AHA recommends people start checking their cholesterol first at age 20, and then again every five years. What risk factors or personal circumstances warrant more aggressive testing? If you have a family history of heart disease, especially if a relative had heart disease early in life, you should be aggressive about having your numbers checked. At UC Irvine Healthcare’s cardiovascular services, we are able to perform noninvasive imaging procedures, including advanced noninvasive testing—a coronary calcium score or a cardiac CT angiogram—as well as genetic tests to help identify those who may be at a higher risk for heart disease. What does UC Irvine Healthcare’s Preventive Cardiology Program offer? It provides a one-stop location where people concerned about their risk of heart disease can be proactive. Our team includes a nutritionist, exercise physiologist and a physician who provide a personalized assessment as well as a personalized treatment plan for each patient. The Preventive Cardiology Program is designed to use research-based interventions and a variety of treatment methods to decrease risk factors for cardiovascular disease progression and improve quality of life. Treatment goals are tailored to each patient’s needs and lifestyle. For more information about heart attack prevention and risks for heart disease, or to make an appointment, please call the Cardiovascular Center at UC Irvine Medical Center at 714.456.6699.